The crowds in Charlotte remind you that millions are still passionate in their support for Barack Obama. Millions of people are still passionate for Obama. The furor over the “better off” question reminds me: What is the upside of going on these Sunday shows? Rarely do we get emails from flacks advising us to “look how awesome our team did on that CNN show that 300,000 people watch.” No. We are told that first- or second-tier campaign spokesmen have bungled something. I remember the days we spent in 2008 discussing the meaning of McCain spokeswoman Nancy Pfotenauer’s “real Virginia” gaffe, which I think was made during some show at 2:23 p.m.
By which I mean that much of the political press corps is now in Charlotte, in various stages of disorientation, and the comments of a possible 2016 candidate are more substantial than anything else. At a midday hangout at the Huffington Post Oasis, Nancy Pelosi got not one but two questions about “better off.” This irritated some bloggers in the room, who didn’t understand why they’d come all this way to hear the same hacky questions. 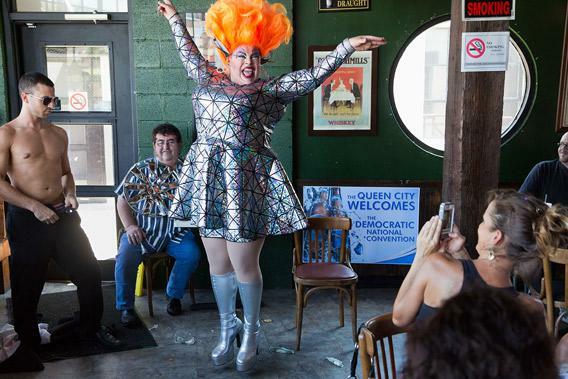 Drag queens welcome the Democratic National Convention at a kick-off Sunday brunch at Hartigan’s Irish Pub, called “First Ladies United”. But it’s a good question! Charlotte, especially by comparison withTampa, is a perfect “ideopolis,” all cafes and new restaurants and a skyline that glistens with the windows of corporate headquarters. It’s good to remember that things are still rotten. North Carolina’s unemployment rate is tied for the worst in the South—9.6 percent. The Occupy protests have a different feel when they tromp past black Charlotte residents wearing Bank of America gear, because they work at Bank of America, and they like their jobs, and the state isn’t brimming with better ones. John, I like your formulation of the Obama campaign demanding credit for deeds and wanting minimal blame for results. Part of that strategy, as you really can see in Charlotte, is pulling inside straights in the states that are demographically sound for the president. After two years of “Obamania fades” articles, in Charlotte, you see people wearing cheesy Obama shirts and carrying Michelle Obama “First Lady of Fabulous” bags and buying street art of the smiling president. 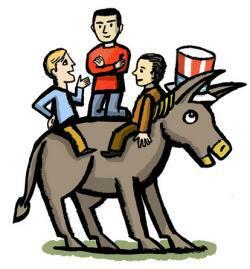 You have never, and probably will never, see this for Romney. And you remember that there are millions of black, Hispanic, and gay voters who still feel passionately that Barack Obama’s been looking out for them. Barack Obama won North Carolina in 2008 despite winning only 35 percent of white votes. Lo and behold, he’s still competitive here. I’m just interested to see how he sells his agenda to everybody else.